Media has always been social. In this course we will study the production networks responsible for great works of literature from the first folio of Shakespeare’s works to the present day. 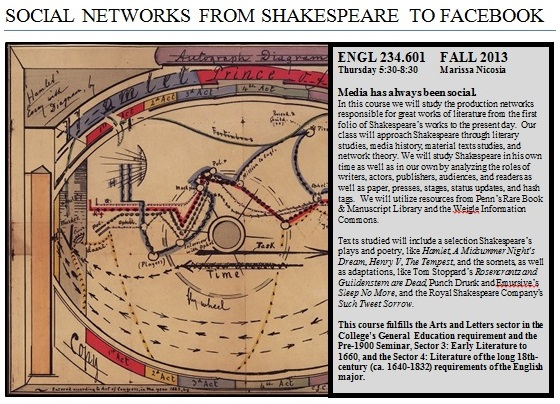 While our class will focus on Shakespeare’s works we will approach Shakespeare through literary studies, media history, material texts studies, and network theory. We will study Shakespeare in his own time as well as in our own by analyzing the roles of writers, actors, publishers, audiences, and readers as well as paper, presses, stages, status updates, and hash tags. The course is designed to develop a critical vocabulary for discussing the formal structures and historical contexts of Shakespeare’s plays, cultivate facility in reading and writing about Shakespeare’s works, and encourage independent and original research on Shakespeare and media. Texts studied will include a selection Shakespeare’s plays and poetry, like Hamlet, A Midsummer Night’s Dream, Henry V, The Tempest, and the sonnets, as well as adaptations, like Tom Stoppard’s Rosencrantz and Guildenstern are Dead, Punch Drunk and Emursive’s Sleep No More, and the Royal Shakespeare Company’s Such Tweet Sorrow. Our class will utilize resources from Penn’s Rare Book & Manuscript Library and the Weigle Information Commons. Course requirements may include brief writing assignments, a performance exercise, in-class presentations, and a final research project.